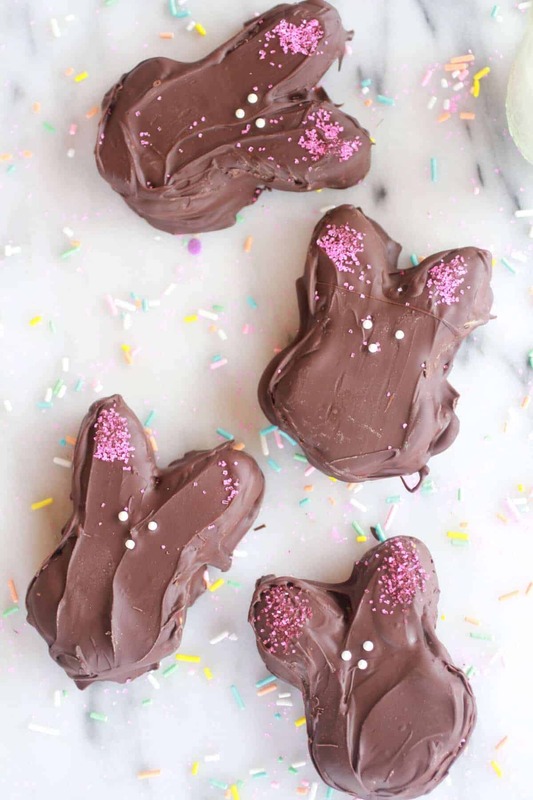 Chocolate Covered Peanut Butter Ritz Sandwiches…the Bunny edition. Then I am going to tell you how to cut them into bunnies (or circles or whatever you have on hand). 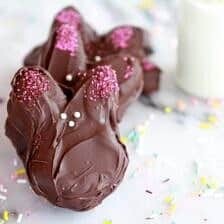 Then I am going to tell you how to stuff them with peanut butter and then I will tell you how to completely cover them in chocolate, and if you’re in the spring spirit, you can even decorate them with some Easter Sprinkles. Basically these sandwich cookies have it all going on. Buttery, sweet, salty, peanuty and chocolatey. Winning Combo right there. Remember when I told you that my grandma sent me some stuff from Sur La Table? While, among the goodies in the box was a bunny cookie cutter. So, yeah you can see what happened next. I just HAD to use it as soon as possible. So I thought and thought and thought some more about what the heck I could cut into bunnies. Seriously, I was pulling my hair out trying to come up with something good other than the obvious sugar cookie. Believe it or not sugar cookies are not all that popular around here. Too much sugar, not enough chocolate. Finally, I was thinking of flavor combos and suddenly I was like Ritz! Ritz, Peanut Butter and Chocolate! You could definitely use store-bought Ritz crackers for this, but I DO NOT recommend it. The homemade version is ten times better and no hydrogenated oils, so that is obviously a bonus. Plus, you get to add as much salt and butter to the top of these as you want! Customized to your liking. 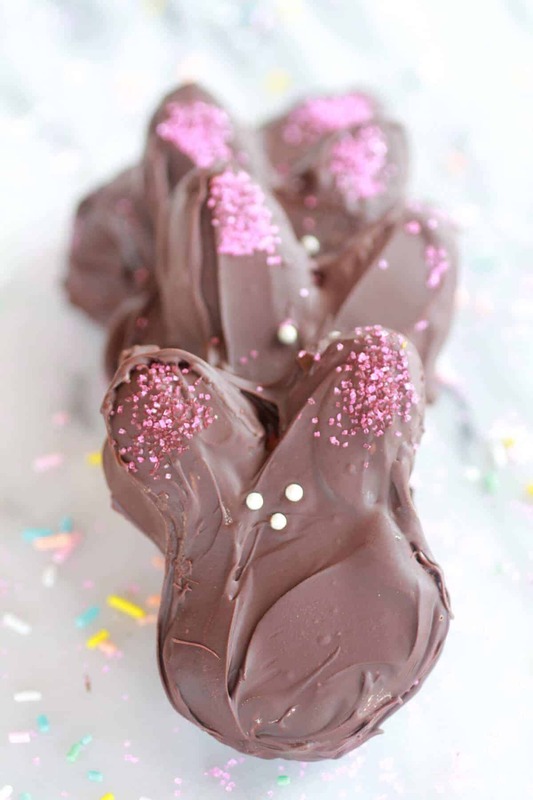 And don’t get frustrated if you can’t make the chocolate perfectly mold the bunnies. It’s a hard thing to do and the extra bumps give them character! Ok, and the peanut filling. It is just ,well, lick every last finger good! Especially sandwiched between two crackers and then covered in chocolate. Good, Simple, Fun and adorable. 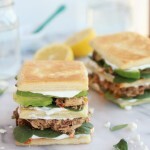 Really, these things are savory worthy. Just rescue a precious few from the in-house chocolate devourers, then stockpile them away for your own little private “after hours” party. 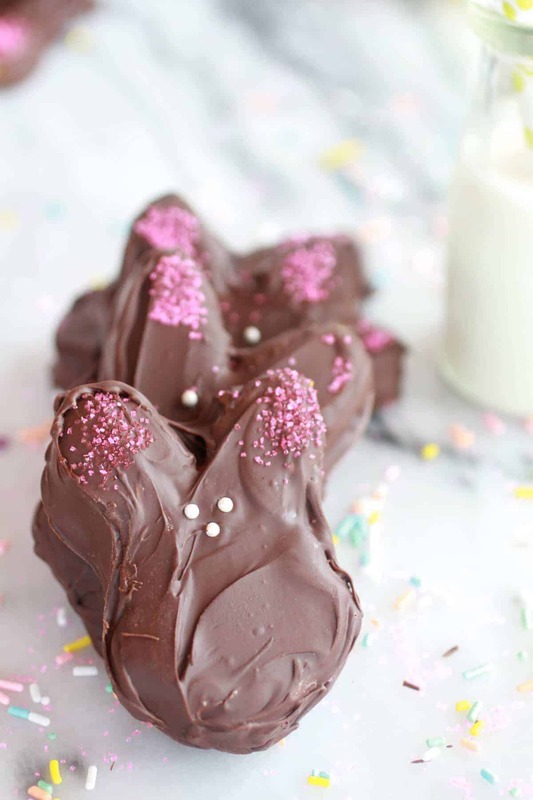 Super cute and tasty treats for Easter! Make the filling by beating together the peanut butter and butter. 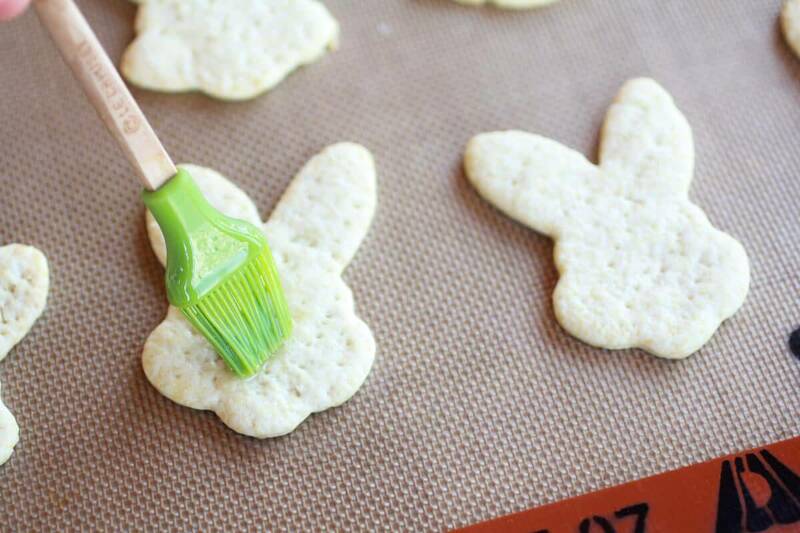 Beat until you do not see any streaks of butter and the mixture is light and fluffy. Add the powdered sugar and vanilla and beat until combined. Cover and place in the fridge well you make the crackers. Preheat oven to 400 degrees. Put the flour, baking powder, sugar, and 1/2 tsp of salt in the food processor. Pulse to combine. Add the cold butter and pulse to combine. Add in the canola oil and pulse to combine. Stream in the water until a dough ball forms. Roll the dough out as thin as you can. (I actually used my pasta maker and it worked really well. 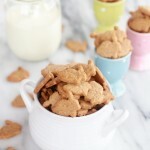 I went to the second setting) Use a cookie cutter to cut the dough out into bunnies or circles or really anything you want! Place on a baking sheet and bake for 10-11 minutes. The tops wil begin to turn golden. Remove from the oven and brush with the melted butter and then sprinkle with kosher salt. Allow to cool completely (this only takes about 5 minutes) before filling with the peanut butter. Once the crackers have cooled, use a knife to spread the peanut butter filling on one side and then sandwich with another cracker. Repeat until all the crackers have been used. I had a total of 18 sandwiches (36 crackers). Place the crackers in the freezer for about 10 minutes. In the meantime melt the chocolate in a shallow microwave safe bowl. Melt on high for 30 second intervals stirring each time until melted. Line a baking sheet with wax or parchment paper. Remove three sandwiches from the freezer and dip in the melted chocolate. 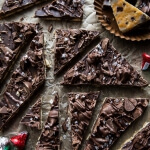 Use a knife to wipe off any excess chocolate and place on the baking sheet. 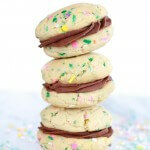 If you would like to decorate these with sprinkle, do so now. Repeat until you have covered one side of all the sandwiches. After you have done all the sandwiches place them back in the freezer for anther 10 minutes. Remove and dip the other side in the melted chocolate. Place back on the baking sheet and use a knife to fill in the sides or any other blank spots. Place back in the freezer for another 10 minutes. Remove from the freezer and store in a sealed container, until ready to serve. I personally think these taste best cold right out of the fridge! Crackers adapted from Cupcake Project. Fun! These are so cute and I loooove Ritz crackers. What a great idea to make ’em at home! Sydney, thanks so much for checking these out! I was really excited to see one of my favorite bloggers comment on my site! Thanks! How adorably cute are these?? They sound so tasty, too! The sweet chocolate combined with the salty cracker sounds perfect :). WOW! Thank you that is so nice of you! Me again. All those recipes look good. Can’t wait to make the pastrami sandwich and then I saw those potato skins. Thank you for sharing. So glad I saw your link on Cheerios and Lattes. I am so glad you found me too! Hope you enjoy all the recipes! These are really cute. Thanks for sharing on Foodie Friends Friday. So Cute! Thanks for Sharing at Show Me Your Plaid Monday’s! I’m visiting from Wednesday Extravaganza and I LOVE these!! I’m pinning to my Peeps! board and I hope to make them this weekend! YEAH! Thanks so much for pinning, I hope you enjoy these! what a neat idea! love the bunnies! Thank you, bunnies are so cute! 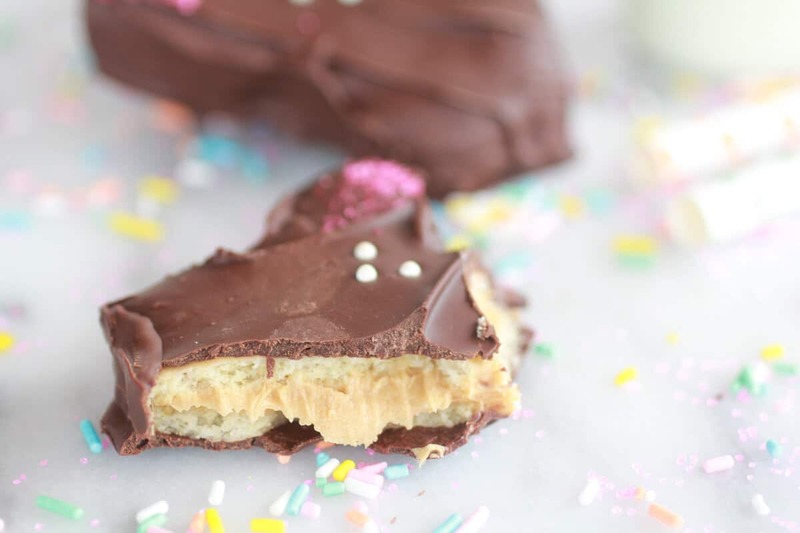 You can never have too many peanut butter cookie/candy recipes. This sounds amazingly delicious!! Perfect!! These are awesome for Easter. I love these cookies. Thanks for sharing these at Two Cup Tuesday at Pint Sized Baker. You are featured this week on Busy Monday at A Pinch of Joy! I hope you will stop by this evening and grab a Featured Button from the Button Box on the sidebar. Pinned. Can’t wait to see what else you’ve been working on! 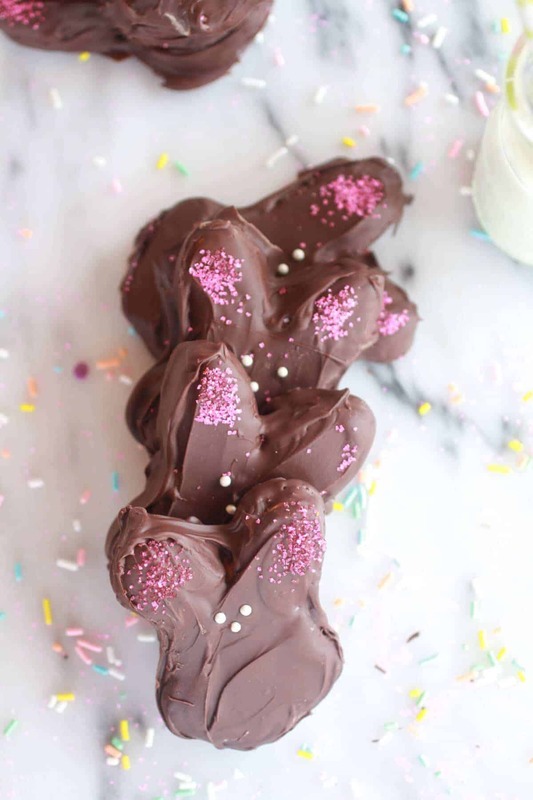 Almost to much goodness…these sound yummy and are so cute! They look wonderful and delicious! Great job. Wow, you just blew my mind! Salty, Buttery, Chocolate, Peanut Butter and Oh so cute. What a great family treasure and you were able to use it in such a fun and unique way. I am pinning this recipe for the future. We would love for you to join our party. I don’t know why, but I never even THOUGHT about making my own Ritz crackers…. What a greta idea! Thank you and thanks for pinning! happy Easter to you to! Homemade Ritz crackers? How cool is that? Thanks for sharing at Time To Sparkle! Oh my goodness, CUTEST cookies (crackers) EVER! These are so cute and would be great for any holiday! Pinned! Thanks for sharing 🙂 Have a great week. biscuit dough from the cutter. For the peanut butter filling, is that 1 stick/ a half cup? Thanks!